Bilateral ties have reached historic lows in the summer of 2018. The major flashpoint has been a Turkish criminal case against American pastor Andrew Brunson. U.S. sanctions on Turkey related to the Brunson case and responses by Turkey and international markets appear to have seriously aggravated an already precipitous drop in the value of Turkey’s currency. Amid this backdrop, Congress has actively engaged on several issues involving Turkey, including the following: Turkey’s possible S-400 air defense system acquisition from Russia. Turkey’s efforts to acquire U.S.-origin F-35 Joint Strike Fighter aircraft and its companies’ role in the international F-35 consortium’s supply chain. Complex U.S.-Turkey interactions in Syria involving several state and non-state actors, including Russia and Iran. Over strong Turkish objections, the United States continues to partner with Syrian Kurds linked with Kurdish militants in Turkey, and Turkey’s military has occupied large portions of northern Syria to minimize Kurdish control and leverage. Turkey’s domestic situation and its effect on bilateral relations. In addition to Pastor Brunson, Turkey has detained a number of other U.S. citizens (most of them dual U.S.-Turkish citizens) and Turkish employees of the U.S. government. Turkish officials and media have connected these cases to the July 2016 coup attempt in Turkey, and to Fethullah Gulen, the U.S.-based former cleric whom Turkey’s government has accused of involvement in the plot. In the FY2019 National Defense Authorization Act (NDAA, P.L. 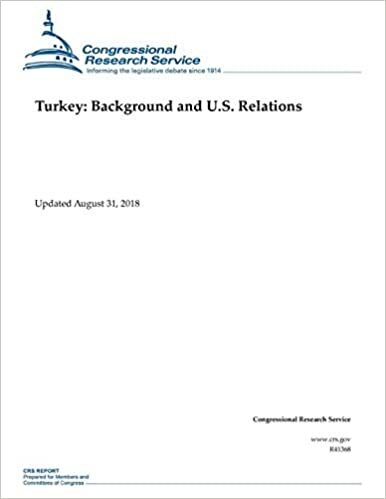 115-232) enacted in August 2018, Congress has required a comprehensive report from the Trump Administration on (1) U.S.-Turkey relations, (2) the potential S-400 deal and its implications for U.S./NATO activity in Turkey, (3) possible alternatives to the S-400, and (4) various scenarios for the F-35 program with or without Turkey’s participation. Other proposed legislation would condition Turkey’s acquisition of the F-35 on a cancellation of the S-400 deal (FY2019 State and Foreign Operations Appropriations Act, S. 3180), place sanctions on Turkish officials for their role in detaining U.S. citizens or employees (also S. 3180), and direct U.S. action at selected international financial institutions to oppose providing assistance to Turkey (Turkey International Financial Institutions Act, S. 3248). The S-400 deal might also trigger sanctions under existing law (CAATSA). The next steps in the fraught relations between the United States and Turkey will take place in the context of a Turkey in political transition and growing economic turmoil. Turkish President Recep Tayyip Erdogan, who has dominated politics in the country since 2002, won reelection to an empowered presidency in June 2018. Given Erdogan’s consolidation of power, observers now question how he will govern a polarized electorate and deal with the foreign actors who can affect Turkey’s financial solvency, regional security, and political influence. U.S. officials and lawmakers can refer to Turkey’s complex history, geography, domestic dynamics, and international relationships in evaluating how to encourage Turkey to align its policies with U.S. interests. Purchase book.